At Octagon, you can get up close and personal with our magnificent exotic animals. Come see Tigers, Bears, Lions, Hyenas and many other popular animals. Learn the amazing stories of these animals and how we acquired and care for them when no one else would. 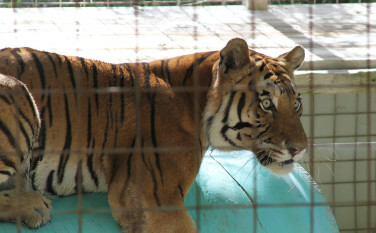 Visit Octagon Wildlife Sanctuary, "The Wildest Retirement Home in Punta Gorda!" Octagon is a forever home to over 150 exotic and other animals that were surrendered because they were no longer useful in a business, private owners no longer wanted them, or confiscations by authorities. For 40 years, Octagon has cared for these types of animals. They can never be released into the wild.